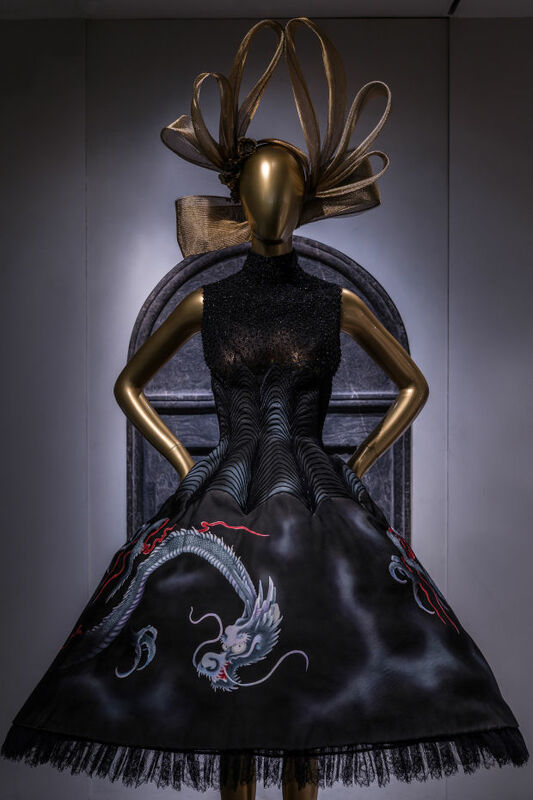 As Fashion Week continues we can't get enough of fashion inspired blogs so this week we are taking a look back at the Metropolitan Museum of Art's China: Through the Looking Glass 2015 exhibition. Harold Koda, Director of the Costume Institute since 2000, is set to retire in the early part of next year and this is his last summer exhibition with the museum. Koda was first trained under Diana Vreeland when Vreeland was beginning to transform the institution from frumpy to chic. His successor will be Andrew Bolton who is best known for working on exhibits like Alexander McQueen: Savage Beauty, and PUNK: Chaos to Couture. Koda ended his reign on a high note - this exhibition broke the museum's record of attendance, a placement previously held by the Alexander McQueen: Savage Beauty exhibition. Through the Looking Glass explored the impact of Chinese aesthetics on Western fashion and China's impact on fashion's ongoing imagination. This exhibition was a collaboration between The Costume Institute and the Department of Asian Art and fashion pieces from designers such as Yves Saint Laurent, Roberto Cavalli, Givenchy and Tom Ford were shown. If you missed this one then you missed a great one, but not to worry - we put together a photo summary below! Videos from Wong Kar Wai's lush drama In the Mood for Love and clips from various other films that incorporated visions of China through pop culture were showcased throughout the exhibit. Multiple mediums were also highlighted - high fashion juxtaposed with Chinese paintings, porcelains, cinema, and other art to reflect Chinese imagery. The fashions shown above are from the designers Tom Ford for Yves Saint Laurent and John Galliano for Dior. True to form, the Costume Institute did not shy away from using reflective surfaces, cinematic lighting, and winding corridors to immerse visitors into this fantasy world. Along with the costumes themselves, the visual appeal of the setting and effects is what makes these exhibitions come alive. The dresses shown above are by the Chinese Couturier Guo Pei and Givenchy. Like the title, Through the Looking Glass, you really do feel as if you are falling into another realm made up of intoxicating aesthetics and mysterious shapes. This exhibition was the largest one to date for the Costume Institute, and we can't wait to see what they have up their sleeve for next year! In honor of New York Fashion Week beginning (today! ), we are taking a look back at the 2015 Fall Ready to Wear styles. Since fall is quickly coming upon us, those looks you once gazed at in magazines are now appropriate to wear! This year one of our favorite runway shows was Burberry. They took Bohemia to the next level by adding fringe to every hem and instead of baggy they went with chic tailored jackets. Burberry wasn't the only one who incorporated brocades, damasks, and other textured styles. Givenchy and Dries Van Noten also took influence from these fabrications more notably shown in interiors. Below we've incorporated Carini Lang's designs with some of our favorite Fall looks. Shown above, accompanied by Carini Lang's Togo design which is a part of our tribal geometric collection, are looks from Burberry's 2015 Fall Ready to Wear collection. A mix of tailored jackets and various prints reminiscent of African motifs create a bohemia chic look. Burberry also showed brocading and florals incorporating bright and bold colors. We love that this fashion house is bringing back the romantic feel of velvets and Victorian florals - reminds us of London in the 60's and how everything was grand and loud! Shown above, accompanied by our Italian Flower carpet, are looks by Dries Van Noten and Burberry. One of the trends this year is clearly taking inspiration from the 1970s and the Gilded Age. With the quirky combinations of complex prints and oversized clothing, there is a certain beauty in the mix of oppositions. While we're excited to take these Fall styles for a spin on the streets, we're already looking forward to seeing what's in store for Spring. Stayed tuned for a blog post on the latest from New York Fashion Week in the upcoming weeks! By now we're sure you've heard of Pantone's 2015 color of the year, Marsala! This tasteful hue is described by Pantone as an, "earthy red wine that embodies the satisfying richness of a fulfilling meal while it's grounding red-brown roots emanate a sophisticated, earthiness." We think this romantic color will go into hyperdrive this fall as people pull out their sweaters and suede dresses and start to put away their gingham prints. Marsala is the perfect color for a comfortable, cozy room or for adding a sophisticated note to an interior. Wondering how to incorporate Marsala into your life? Read on for more tips! 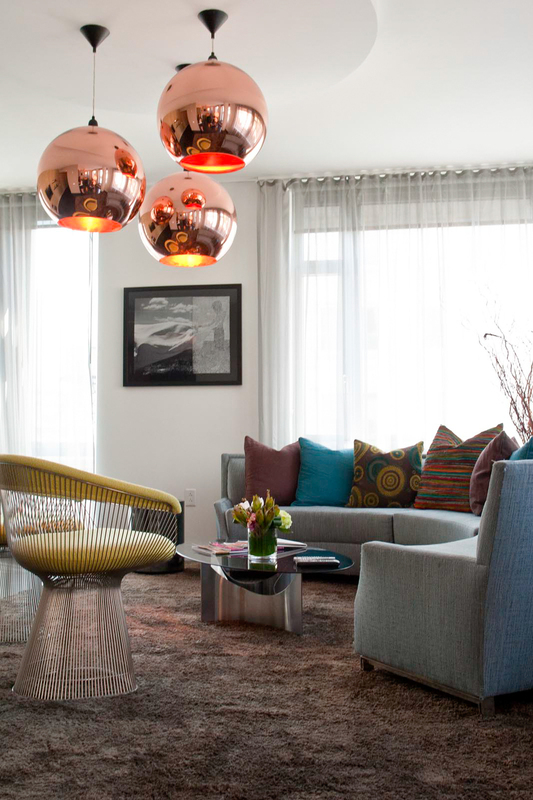 Pantone's color of the year is easier to incorporate into your interior than you think. Because Marsala is a color you often see in nature, it is soothing and pleasing to the eye. Pantone recommends pairing it with neutrals, golden yellows, or umber. If you're worried about painting your walls then start by finding the perfect carpet as a foundation. Adding a pop of color to your floors gives you freedom to play around with textures in your furniture and add accents around the room without overpowering the interior. Carini Lang offers several options that incorporate Marsala with organic colors into a great design. Whether or not you pair a Marsala colored carpet with creamy furniture pieces or go bold with a Marsala paint color, this color always looks sophisticated. As with any color trend, this color is open to interpretation. Along with true Marsala you can dive into other variations of reds which can work together in the same room or just choose one tone to run with! Check out some of Carini Lang's carpet designs to start you on your wine tour! One of the things that keeps us inspired and thinking creatively is traveling - the seeing, smelling and exploring that comes along with it - and today we've got Seattle on the mind. The skies may be gray and the vibe may feel toned down but this city is vibrant and filled with color. A few of the city's nicknames are 'Rainy City,' the 'Gateway to Alaska,' and of course 'The Emerald City' and with many names comes much to offer. Seattle is the largest city in the Pacific Northwest region of the United States and it has a neighborhood for everybody. Whether you're eclectic, urban, outdoorsy, artsy, posh, or gritty the quirky character of Seattle offers a lot of variety. You need more than a weekend to get the full scope of Seattle, but if a weekend is all you have then here are some tips on what top spots to visit. This famed Seattle tourist destination was one of the first permanent farmer's markets in America. Shops start setup early around 6AM and buzz well into the evening. Browse the fish at the world-famous fish market- they'll be practically thrown into your hands, freshly caught and delivered. The market is an easy transit ride (or nice walk) to the Seattle Art Museum and other Downtown sights. In 2005 CNN named Bainbridge Island the second best place to live in the United States, and we don't think much has changed since then. From the heart of downtown Seattle, Bainbridge Island is a quaint community just a 30 minute ferry ride away. Check out the walkable harbor area with a public boardwalk and small shops and restaurants. Another draw is the island's main street dotted with excellent art and book shops, and yummy eats like Blackbird Bakery (their toast is a must try!). Just up the hill from downtown, Volunteer Park is one of the oldest, and grandest parks in the city. Situated in the heart of the historic, ritzy, and eclectic Capitol Hill neighborhood, Volunteer Park offers an easy escape from the nearby buzz of city life, as well as some incredible views. Be sure to climb the narrow staircase of the old water tower - it's worth the climb to see the 360-degree views of the skyline, space needle, Olympic and Cascade Mountains, and the waters of Lake Washington and the Puget Sound. The Asian Art Museum and Conservatory are also located in the park. Seattle Center was first built in 1962 for the World's Fair and contains a wide range of facilities from restaurants, parks, and several museums. During Labor Day weekend, Seattle Center hosts the annual Bumbershoot Music Festival, celebrating art, music, and culture in the Emerald City. Enjoy live music and excellent eats among Seattle's top museums like the Chijuly Glass Museum, and bask in the Northwest sunshine underneath the Space Needle. Facade of Melrose Market, and a peak inside too! A smaller version of Pike Place, also located on Capitol Hill, is Melrose Market which offers world-class dining and a variety of Northwest-inspired eateries. Melrose Market has become an alternative to the always crowded Pike Place for residents. The market is on a unique triangular block with historic automotive buildings constructed in 1919 and 1926 - all adding to the quintessential Seattle charm. Be sure to hit Homegrown for sandwiches and salads, or Taylor's Shellfish Farms to fill your seafood cravings. Starbucks fanatics can visit the new Roastery building just next door as well! Before it was called Tribeca, before Robert De Niro made it cool, and before it became an artist's community, this downtown nook was known as Washington Market. In the mid-nineteenth century, New York's piers moved to the Hudson River, and The Washington Market served as New York's main food destination. Certainly not the cleanest area back in those days, the New York Times once described the market as a 'dirty, degraded little rat hole,'. Back then the buildings around the Market may not have seemed notable, but the historic buildings that still stand in Tribeca are a huge part of the draw in this neighborhood today. Some of the world's first cast-iron structures adorned Washington Market's streets, and today only a few have survived. The neighborhood was home to numerous warehouses and loft buildings - many constructed in the Romanesque Revival style. Unfortunately many have disappeared over the years, but you can still wander Tribeca and find some beautiful examples. It wasn't until the 1970's when Tribeca began changing drastically. Artists who were tired of SoHo and the increased rent there started to move down to Tribeca. They embraced the high ceilings, and spacious streets and took up residence. It was around this time that the neighborhood also got a new name - TriBeCa - an acronym for Triangle Below Canal. With the growing population came growing fear that the unique elements of this neighborhood could all be gone one day. The new pioneers of Tribeca saw the history and architectural value at stake and led the fight to preserve it's character. With every preservationist fight comes a desire from new groups to reside and buy there. Just like Jane Jacobs and the fight to preserve Greenwich Village, Tribeca's fight led to the neighborhood's prestigious residences and increased rent, making it the most expensive zip code in Manhattan in 2015. Not only do some of the biggest household names live in this neighborhood, but the area also plays host to the annual star-studded Tribeca Film Festival. Carini Lang's showroom is located in Tribeca's West Historic District on Greenwich St. between Jay St and Duane St. Our building was one of the last high-rise offices built in the area (1930-1931) by the famous New York Architecture firm Cross & Cross. The building was home to the Central Hanover Bank & Trust Company for several years before architectural offices moved in, and then finally our flagship showroom. We feel privileged to work in such a unique space - a beautiful historic building with high ceilings, columns, a vault (!) and the coolest copper and brass doorway you may ever see. We love being a part of this special downtown community that still feels like a neighborhood where people know each other and share the same desire to preserve Tribeca's history. A before and after shot of the view from our front steps! It's hard to find these days, but this chick possesses the glamorous and occasionally gritty downtown New York vibe that's dwindling with each Starbucks pop-up. For that and many reasons, our muse of the week is Chloe Sevigny - an actress, model, fashion designer, and all around Nineties icon. In the early Nineties it was her fashion sense that got her the title of 'It Girl' by Jay McInerney, a journalist for The New Yorker, who wrote a 7-page article on the then 19 year old's style. When it comes to her film career, her motion picture debut in Boys Don't Cry in 1999 brought her Hollywood fame. She was nominated for best supporting actress for both an Academy Award and a Golden Globe. Despite the stardom and recognition, Sevigny isn't the typical Hollywood starlet - she has stayed true to her unique looks and style, avoiding trends, plastic surgery, and the negative spotlight. Along with her fashion sense, Sevigny has received much press over her East Village apartment. She hired David Cafiero, who owns a tiny antiques shop in Cooper Square, to redesign her apartment and mix her eclectic style with her nostalgia for Connecticut. With low beamed ceilings this residence is reminiscent of a country retreat. Her antique carpets used throughout with colorful, fun wallpaper show off her quirky side perfectly. Sevigny most recently moved to Park Slope, Brooklyn and her co-op still has the original antique wood floors - a perfect traditional backdrop for her to add her unique style! Stanford White is most notably known for being one of the founders of the architecture firm McKim, Mead, and White. He is also known for designing the Triumphal Arch in Washington Square park. Although his architectural resume includes some heavy hitters such as Madison Square Garden, the New York Herald Building, and the Manhattan Municipal building, White always had a passion for the decorative elements as well. He possessed an incredible talent for interior design and furnishing and he loved collecting antiques, paintings, and sculptures. White thoughtfully took his clients' personalities into account and had an attention to detail that added an incredible personal element to residences he designed. Frank Lloyd Wright is considered one of the world's greatest architects, but he was also considered quite controversial. Wright was known for several different types of architecture including his organic designs that were based on the philosophy of building around nature and for nature. Besides the incredible work he did on the outside, he also designed every interior from head to toe. To him, form and function were one. Wright had a vision for every building he worked on and he saw that vision all the way through from the stained glass to the carpeting. He designed structures with a certain sentiment in mind - architecture for everyman, instead of everyman for one type of architecture. Charles Gwathmey was lucky to start his career by designing, with complete freedom, his parents' Amagansett house in 1965. He treated the residence like it was a piece of sculpture by bringing in primitive forms and pops of primary colors. While the outer structure had a modernist or even "harsh" boxy look, the interior had a more organic feel. It became the modern beach house that is mimicked all over the Hamptons today. Later on in his career he was recognized as part of the "New York Five", a group of architects with a common allegiance to a pure form of architectural modernism. One of his signature decorative elements was to add a curve feature to accentuate certain rooms. His interiors were known for complimenting his larger than life architecture, while maintaining sensitive and minimal characteristics. In 2004 Zaha Hadid became the first woman recipient of the Pritzker Architecture Prize. She has designed buildings all over the world; from museums to retail stores as well as commercial buildings. Her architecture is characterized with large curving structures and is distinctively neo-futuristic. Hadid has also been undertaking more interior design and production work. Not only has she been collaborating with design companies such as B&B Italia and Lacoste, she also oversees the interiors of her own projects. Hadid incorporates sculptural walls, curvaceous ceilings, and angular furniture, always creating an interesting look. Her interiors flow from room to room and offer so many unique details - there is always something new to explore. David Rockwell has not only created an award winning firm for Architecture and Interior Design services but he employs strategists, coders, and engineers to round out his team. Rockwell Group is innovative and tech savvy - the firm embodies the sentiment of how an environment can change a person's attitude. Rockwell is able to imagine new worlds and is never afraid to ask the question 'What If?' (hence the title of his book). This sense of imagination and exploring comes from his upbringing in the theater, and his continuous work with set design for Broadway theater productions. His interiors showcase this train of thought by incorporating state of the art lighting systems, and arresting visual effects. Although he doesn't literally bring the theater into his designs, he keeps it in mind when creating areas for the forefront or background of a project- where clients or visitors can be seen or unseen, perform or just observe. Shag is back. And let's be honest - it should never have left! Over the years shag rugs have been synonymous with the culture and lifestyle of the 1960's. Flashbacks of Burt Reynolds in Cosmo and gaudy, over the top interiors come to mind. But did you know historians believe the first use of shag carpets dates back to Ancient Greece? Even Alexander the Great was a fan of the shag, but back then it was called a Flokati rug. These rugs were used so people could sit comfortably and keep their feet warm. Flokati rugs were hand woven from goat hair and were also found throughout Turkey and Central Asia as far back as 331 B.C. Although the popularity of shag-style rugs went up and down throughout the centuries, they hit their peak during the 60s and 70s. For a time period that was all about experimenting, the shag carpet was a look and style that caught on fast and practically became a way of life. During this time, carpeting rooms wall to wall was still a new phenomenon and once the Brady Bunch did it in a variety of different colors, people jumped on the shag bandwagon. Need we say more? Clearly a fan of the shag trend, Jayne Mansfield decided to line her whole bathroom in pink shag. Now we're not saying to go this far, but we do think adding shag into your interior is a plus! Whether incorporating a solid brown shag that complements modern furniture or adding a pop of color, shag rugs can be used in so many different ways. Even a rustic interior can be the perfect place for a shag carpet: shown above in the Walden house, a taupe shag is mixed with leather furniture and a floor to ceiling bookcase. No matter where they are placed, shags are the perfect accent if you want to come home and sink your feet into something luxurious. If you're not convinced, visit our showroom and we can show you how we can customize pile height, color, and material! From the early 20th century to nowadays, stripes have never been out of style. They're basically considered a staple in your wardrobe and we think they should be for your interiors too! Whether thick or thin, traditional or modern, stripes are a great way to reshape any room - and they're so versatile! They can be bold, tone-on-tone, or a classic black and white. Striped carpets are a simple way to add a powerful pop of visual interest to any room while staying on trend! Here at Carini Lang we enjoy helping you choose the best fit for what look you're going for - whether it be a striped Sumak (shown above) in a beach house, a classic pinstripe for a little sophistication, a fun and graphic thumbprint design (also shown above), or a custom stripe in various widths and colors to add character. Carini Lang offers tons of options and stripes are always the way to go! Sophisticated, unusual, and endlessly appealing, a Sumak rug is a conversation starter. An historic technique that's older than traditional piled carpet weaving, this weave requires the work of the most skilled artisans. They work by wrapping each weft over four warps, then pulling the wefts back through first two warps, and on and on until a textile is formed. No knots are tied in the process which makes the textile that much stronger. With this technique comes great durability that will last in even the most high traffic areas. A Sumak rug just might be your next great statement piece! The Sumak weave comes from the Caucasus region and is said to be named after the the town Shemakja. The word Sou from [soumak] means needle in Persian- so the meaning is also connected with needle-work. The Caucasus region is situated on the border of Europe and Asia between the Black and Caspian seas. In Greek mythology the region of Caucasus was considered one of the pillars supporting the world. It was also the place where Jason ventured to find the Golden Fleece! To the rest of the world it has been known as a region of consistent political strife. What most people are unaware of is its rich weaving history that dates back to the Bronze Age. Traditionally these flat-weave rugs were hand woven with wool and sometimes embroidered in silk. Sumak rugs are woven with a similar technique to Kilims - they are both flat weaves but the difference is in the backing. Unlike Kilims, Sumak rugs are not reversible and the back of the Sumak has threads that hang 2-4 centimeters long. This creates a cushion and is more thick and durable as a floor covering. The patterns presented are traditionally geometric and contain tribal motifs from different regions. The Caucasus area is of great ecological importance and has a wide range of wildlife, from leopards, brown bears, wolves, bison, golden eagles, and not to mention over 1,000 spider species. The environment alone sparked inspiration for the beautiful motifs used throughout the Sumak textiles. Sumak carpets bring rugged authenticity and an earthy honesty to an interior. Today more and more we see this applied in rustic or beachy interiors where many Sumak carpets, old and new, have come to be used. Although perfect for those settings, the beautiful texture in a Sumak carpet is a design element that can be used almost anywhere. These carpets are perfect for high trafficked areas in your home as they are durable and can easily be cleaned. Carini Lang offers a modern take on the ancient weave by creating our graphic designs in Sumak weave as well as our Arrow Sumak weave. Our Sumak carpets, along with every carpet we produce, is made by hand and can be guaranteed that no two are alike. We are throwing it back this week to our Back Against the Wall Graffiti Show. Last Spring we launched our Artist Collaboration collection with many graffiti artists from around the world. If you attended the show then you remember the POST NO BILLS signs built especially for this opening to surround our showroom columns. These bright blue boards not only set the scene of bringing the street world indoors, but also served as a raw canvas that night where party chaos ensued when artists began tagging and signing them right in the middle of the show. We are finally putting these one-of-a-kind boards up for sale from now until the end of August! The board shown above has tags from street artists PIXOTE, Rusk, Stink Fish, Third World Pirate, Janz, ELLE, and several others. Pixote, born in Brazil, moved to the Lower East Side in the early 90's. Pixação is a Brazilian graffiti style that Pixote specializes in and is characterized by "the bigger-the-better" letters made up of what looks like cryptic wingdings, and cave paintings. ELLE has been making a name for female Graffiti artists around the world. She is known for painting positive female warriors who protect her on the streets. This board is spectacular with tags overlapping tags and bright colors throughout. The board shown above has a full sketch from street artist BEAU, whose work can be found all over the city. He is best known for his mysterious romanesque faces - examples shown above in both Carini Lang's carpet and a piece of his studio art used in an interior. BEAU has been breaking his way into galleries and had his own solo show last December here in the Carini Lang showroom. Also shown on this board are tags from street artists WOMP, Stink Fish, and Robert Janz's poetry. Robert Janz painting one of the boards! The board shown above has a "Bisoman" painting by Robert Janz who has been creating art for over 50 years. He is known in the Tribeca community for his street art, but his resume expands from galleries to the Berlin wall. In 2012 he was asked to be the first person to have a second solo show at the John David Mooney Foundation International Currents Gallery in Chicago. His show titled, Slow Kinetics, explored aspects of motion and change. Also recognizeable on the board is a sketch by BEAU, ENX, and several other street artists. The board shown above has tags from SABIO, WOMP, Stink Fish, and shows part of Janz's Bisoman painting. This board is particularly interesting because of the collage effect you receive from the tags layered on top of each other and the vivid colors poping against the cobalt blue background. All of the four boards shown above are priced at $200.00 - L 96'' x H 48'' x W 3/4.'' These boards showcase the street artists Janz, Stink Fish, Sabio, ENX, WOMP, and several anonymous artist. All of our "Post No Bills" collection boards can be used as works of art, interior decor, cut in half, hinged to make door panels - the creative ideas are endless! With each purchase you will also receive a limited edition t-shirt created for the Back Against the Wall event with lettering by BEAU! Morocco has been home to expats for centuries, and the mystery of what awaits across the Atlantic continues to draw people there today. The magic of this colorful place, where spies, criminals, and writers once took refuge, appeals to a thirst for adventure and escape. We dream of visiting to feel immersed in a world that no longer exists - to see what Paul Bowles saw and wrote about. The brave ones stay and live and produce masterpieces. The rest of us await our turn. In Arabic, Morocco means "far west" or "where the sun sets." and the imagery of the fiery setting sun reminds us that this westward country is a land of entrancing color where groups of buildings, and even whole cities, are painted in jewel-like tones, Marrakech is the red city. Chefchaouen, blue. And Fez is a magnificent green. The hues that resonate from the Atlas Mountains, the mighty Sahara, and the titanic coast line add to the rainbow that is colorful Morocco. In the 1960's, The Rolling Stones went on holiday to Morocco in search of musical inspiration and found the music of berber men, a fusion of African and Arabic, to be just the remedy. Morocco was to the Rolling Stones what India was to the Beatles. The trip originally began as an escape from the confines of England's Press (and coincidentally some drug charges) but eventually stirred up some major changes for the band. When Brian Jones, the band's original frontman and founder, became aware of bandmate Keith Richard's secret relationship with his girlfriend Anita Pallenberg, a downward spiral began. Jones fell into a mania, accompanied by a serious drug problem, and he eventually went back to London and was replaced in the band by Mick Taylor. What happened to the rest of the group after their dramatic and inspirational time in Morocco? They spread their unique sound across the globe and created legendary albums like Exile on Main Street, and Sticky Fingers. Morocco has been a point of inspiration for legends in the design world as well. Jacques Grange was an interior designer to Francis Ford Coppola, Valentino, and Francis Pinault, to name a few. One of his longest working relationships was with Yves Saint Laurent, which continued for more than 30 years. It was Laurent's final home in Tangier that Grange considered to be a revelation. The simplicity within the interiors was unlike any other Laurent home - the place was not full of antique collectibles, renaissance bronzes, or walls of paintings. Grange stated, "For the first time in his life, Yves wanted a restful, open, happy environment - not a treasure palace." Grange carried influences from Morocco into many of the interiors he worked on, inspiring other designers to follow suit. An interior shot of Yves Saint Laurent's Tangier home. Grange was blazing a trail back in the 80's but Moroccan rugs have become something of a trend these days. Many companies offer rug reproductions inspired by the different Moroccan tribes. Design elements such as the lozenge, chevron, cross hatching, and x-shapes are all characteristic of traditional Berber motifs. Modern day replicas are catching to the eye, but there is nothing like the material and quality of vintage Moroccan rugs. Today, many new Moroccan rugs are made in a more mass produced way for the market. They use machine spun wool that is processed as opposed to pure wool combed from the weavers own sheep. Berber men and women would weave these rugs for themselves with materials from their backyards, and because of the high altitude, the wool is much fluffier. This personal touch is another reason why Vintage Moroccans are far more superior. Along with the quality you feel from a vintage Moroccan rug is the warmth and wonder it gives to a room. The sumptuous shaggy texture compliments contemporary and modern interiors as well as traditional ones. Each unique piece reminds us that these rugs, like our homes, have a personality - a story. The Berber people did not have a written language, and stories were passed down through motifs in textiles. Our Creative Director, Joseph Carini, is a collector of Moroccan rugs and has been acquiring special pieces for over a decade. This collection is finally available for purchase and can be viewed on our website. All of our Moroccan rugs are housed in our New York showroom, where our sales team can help you with questions about pricing and shipping - find your Moroccan inspiration here! When Rizzoli Bookstore closed its doors last year after 30 years in its 57th street location there was quite an uproar in the neighborhood. The iconic building was adorned with high vaulted ceilings, a gorgeous chandelier, and an old world feel that is fading fast in New York City. The owners of the building - The Vornado Realty Trust and the Lefrak family - have decided to demolish the building to make way for a new high rise. Before the building could gain status as an historical landmark, the Rizzoli Bookstore had to pack up and relocate. On July 27th, Rizzoli's new location in a Flatiron building on Broadway and 26th opened it's doors. This will be the bookstore's third location in Manhattan since their beginning in 1964. To commemorate this new page in Rizzoli's history, the head of Rizzoli, Charles Mier, has asked Andre Leon Talley to dress the new bookstore window. Talley is the former editor-at-large for Vogue, and is known for being a front-row staple at fashion shows. With only ten days to complete the look, Talley immediately knew he wanted to include Manolo Blahnik, whose new book Fleeting Gestures and Obsessions will be published by Rizzoli this September. The idea was to represent a book hoarders dream and the warm cozy feeling you get from being surrounded by stacks of books. Featured in the window are lacquered trays by John Derian, pieces from Gucci's fall collection, and looks from Vivienne Westwood. Some of the books Talley chose to include in the window are works by Tolstoy, Truman Capote, Andy Cohen, Flaubert, and Frederick Douglass. Biographies, novels, and manuscripts alike are a direct inspiration to us here at Carini Lang and themes, colors, and imagery from favorite books frequently influence and appear in our carpet collections. Whether it's textile studies, color theory, or reading our own clients' latest books; there are fresh ideas on every page and there is always a satisfactory feeling when you finish a good book. Rizzoli was always a sanctuary for those looking for inspiration, and we are happy they have found a new home to continue their journey. Before this post turns too nostalgic, we would like to share some of our favorite Rizzoli book covers with you - inspiration awaits! All of these books were published by Rizzoli and can be purchased either online or at their new book store location. Donna Karan is the quintessential designer for American fashion and has completely changed the way women dress. After 31 years as Chief Designer of Donna Karan International, Donna Karan announced on June 30th, 2015 that she would be stepping down from the legendary role. She will now direct her focus on her Urban Zen Initiative, which she founded in 2001. She will still be an advisor to the DKI brand but the company will not be showing this September at New York Fashion Week. Donna Karan has been transforming the fashion world since her earliest days in the business. Before she launched her own company in 1984, Karan was one of the first designers to release a lower-priced secondary line with Anne Klein - a move she repeated with DKNY in 1988. Besides creating her "seven easy pieces" wardrobe, which made going from work to a chic night club a piece of cake, she became the first designer to use stretch fabric. Her designs are practical, empowering, and womanly - a recipe for success. In 1992 Donna Karan's fresh take on an Ad Campaign titled 'In Women We Trust,' followed a woman on the campaign trail. The model was shown being sworn into office, with bodyguards, giving a speech. Karan stated to New York Magazine, "It's simply a statement that when times are bad - and this country is in trouble - you turn to the motherer, the nurturer." Karan continues to break the mold and fight for issues she holds close to her heart. In 2001 her husband Stephan Weiss passed away from lung cancer and from this tragedy Karan started the Urban Zen initiative to raise awareness about heath care. Urban Zen creates, connects, and collaborates to inspire change around the world. Carini Lang has been a part of the Urban Zen Holiday Marketplace for two years now and has had the chance to develop a relationship with Donna Karan. It has been a pleasure for us to discover what a wonderful person Donna Karan is - a rare, beautiful, thoughtful person that you don't think to encounter often in the fashion industry, or even in everyday life. She is a woman who has decided to leave her high fashion post for one that is empowering cultures, and encouraging artisanal work. Those around her can feel the positive energy she carries and there is a sensibility and invisible strength within her. Carini Lang wishes her great success on her next inspiring adventure! This Summer the New York Botanical Garden's blockbuster exhibition of Frida Kahlo: Art, Garden, Life examines her intense appreciation for botanicals and her love of Mexico. Visitors and Frida fans get the chance to experience the artist from a "botanical" point of view. Along with over a dozen original paintings and drawings by Kahlo the reimagined gardens transport you to Kahlo's studio and Mexico's natural world. Kahlo's paintings come alive as visitors walk through plants and surroundings that influenced the artist and were featured in her work. Celebrated set designer Scott Pask, known for the sets of 'The Book of Mormon,' and the Botanical Garden's Monet exhibition, has approached this exhibition with the goal to bring Mexico to New York City. Pask incorporated elements from Casa Azul, Blue House, where Kahlo was born and lived with Diego Rivera until her death. Such elements include a reproduction of a bright yellow and red pyramid Diego built for their home in Mexico, terra cotta planters, and cobalt blue walls. You can see plants such as calla lilies, sunflowers, dahlias, marigolds, and bright yellow flowers from the Jerusalem thorn tree. This is the first solo exhibition on Frida Kahlo in New York City in over 25 years, and is the first one to focus on her personal interest in the botanical world. The New York Botanical Garden continues to focus new exhibitions around monumental figures and helps to tell their stories through nature. We look forward to following along as they further explore the significant relationship between people, plants and their surroundings. This exhibition will be on view through November 1st, 2015. William Baldwin Jr., also known as Billy Baldwin, was a New York interior decorator, characterized as the 'Dean of Interior Decorators'. Baldwin's work was neat, tidy, polished, and above all American. Baldwin knew how to mix the old and new flawlessly and he always incorporated furniture pieces that his client already owned. He firmly believed that a decorator's job was to create luxurious comfort that suited his client's personality. Baldwin's clients included Diana Vreeland, Cole Porter, Jacqueline Kennedy Onassis, and Paul Mellons. Baldwin's bold and beautiful aesthetic remains relevant through each decade, inspiring all of us to choose quality, comfort, and to always keep in mind our own style above everything else. Take a look at our Pinterest board to dig deeper into the colorful world of Billy Baldwin. The Brooklyn Museum is showing an exhibition completely focused on Jean-Michel Basquiat's notebooks. Born and raised in Brooklyn, Basquiat was a self taught artist and at an early age showed immense talent for drawing. Inbetween dating Madonna and selling his first work to Blondie's Debbie Harry, Basquiat was the youngest artist to showcase at Documenta in Kassel, Germany at the age of 21. His career quickly took off and he became known for his cross-cultural interests and his distinct interplay of text and images. Unfortunately at the young age of 27 Basquiat passed away from a drug overdose. This exhibition emphasizes the use of text and imagery in Basquiat's art, and provides insight into the importance of writing in the artist's process. The notebook pages on display contain early renderings of iconic imagery such as tepees, crowns, skeleton-like figures, and grimacing faces. The drawings in these notebooks also appear throughout his large-scale works. Early on in his career, Carini Lang's Founder and Creative Director, Joe Carini, was inspired by Basquiat, the art of tagging, and the inclusion of text in art. When the Occupy Wall Street Movement began stirring in NYC, Joe was motivated to explore these themes by photographing street art and connecting with the artists he encountered along the way. A collection erupted from those collaborations and our 2014 graffiti-art show "Back Against the Wall" showcased over 20 artists, including DAIN, RAE, JIM JOE, BEAU, STINKFISH, READER and COST. Basquiat: The Unknown Notebooks is organized by the Brooklyn Museum and is curated by Dieter Buchhart and Tricia Laughlin Bloom. This exhibition will be on view from April 3 - August 23, 2015.